The Master of Darkness teams with G-Man Vic Marquette in two never-reprinted pulp novels by Walter B. Gibson writing as "Maxwell Grant." 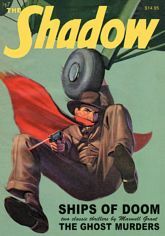 First, an enigmatic message from a dying man leads The Shadow to uncover the strange secret behind "The Ghost Murders." Then, the Master of Darkness intervenes when "Ships of Doom" are destroyed by a hostile power! BONUS: A Sheridan Doome, Naval Investigator mystery by Steve Fisher. This collector's special showcases the classic color covers by Graves Gladney and George Rozen, the original interior illustrations by Tom Lovell and Edd Cartier, and historical commentary by Will Murray and Anthony Tollin.